A trip of an extravagant 48 miles, to be precise. Since time was not pressing, we first popped into Newton Abbot to do some shopping at a pleasant enough Sainsbury’s supermarket. Apart from being “a considerably more pleasant shopping experience” than the Newton Abbot very drab and oddly arranged Tesco store (the plastic bread is at the opposite end of the store to the real bread), it had the irresistible advantage of being right next door to a McDonalds with McWiFi. After shopping I sauntered in to McDonalds and ordered two espressos while Carol went to sit down and connect. “We don’t do espressos”, I was informed by the McCheerless McAssistant, “only cappuccinos, white or black”. “I can’t work out how you don’t do espressos when a cappuccino is a shot of espresso with frothed milk”, I ventured. Stony silence from McCheerless. I surrendered. “One cappuccino and one white, please”. French McDonalds do espressos, darn it. We returned, hitched up, bad fond farewells to my newly met relatives, Mr and Mrs D. Curd, and to a quite pleasant Stover Caravan Club site. The 48 miles to Looe took us over the Tamar toll bridge which, to our surprise, was free heading west and we checked in to the Looe Caravan Club site after an easy hour driving. Fortunately, no other Curds were expected at this site so our bill was right first time. Either the Caravan Club requires its wardens to have had a charisma bypass or they’ve mostly done stints at McDonalds as part of their customer service training. Whatever, we drove around the half of the site which was open, the hard-standing, enviously eyeing-up the closed grassy half of the site. We selected a grey, gravelly hard-standing spot and pitched up. The hard-standing may be very useful in winter but the grey gravel and tarmac drives tend to give the site a bit of a charisma bypass, too. You can’t beat a bit of cheerily green grass for character. 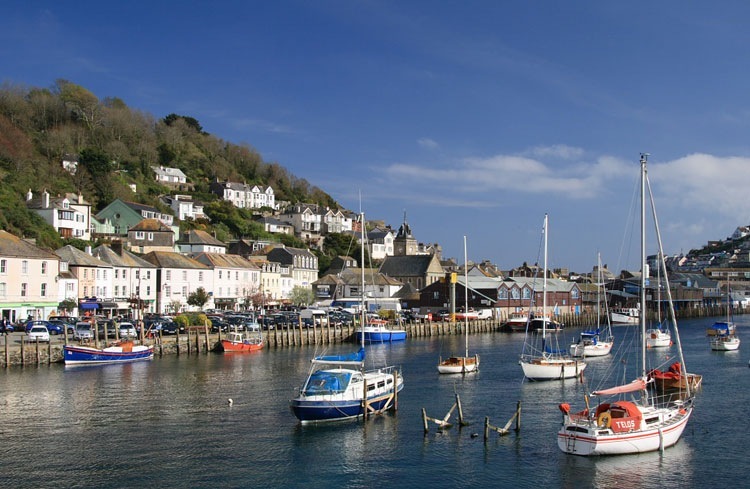 Looe is at the bottom of the very same long and quite steep hill that is topped by the Looe Caravan Club site. After lunch we wandered down for our first explore, dreading the climb back up. Looe is home to a large wholesale fish market but seems to be a little short of retail fish suppliers; we found only one but marked it as somewhere to visit again, probably tomorrow. We probably won’t be up early enough to observe the wholesale fish market in full cry.